Mannlicher M 95 Cavalry carbine. Very nice bride blade with Hungarian maker's logo; F.G.G.Y. (=FEMARU FEGYVER GEPGYAR =Arsenal Budapest) on ricasso and Austrian Eagle crest on reverse side of the ricasso. Some light field sharpening to the blade. Pommel Reg. marked 1 F.B. 8732 (( = 1. Festungsartillery Bataillon - Brixen.). Nice bright pommel and crossquard with adjustable sight mounted on top muzzle ring. Wooden grips with some dings. Black painted metal scabbard with Austrian Eagle crest on frogstud and no dents. 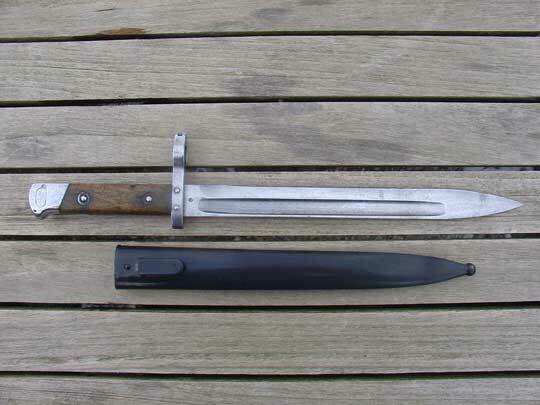 Nice Hungarian made M 1895 cavalry type bayonet.